Finding good images is something that everyone with an online presence needs to do. If you are lucky enough to have a natural flare for photography and a photogenic subject matter then you probably won’t be needing stock photos but for the rest of us, we will need images. Can you just use any image from Google? NO! Just because an image is available on the internet doesn’t make it free to use. The standard copyright regulations still apply and you are liable to fines of several thousands of pounds for using images without permission. 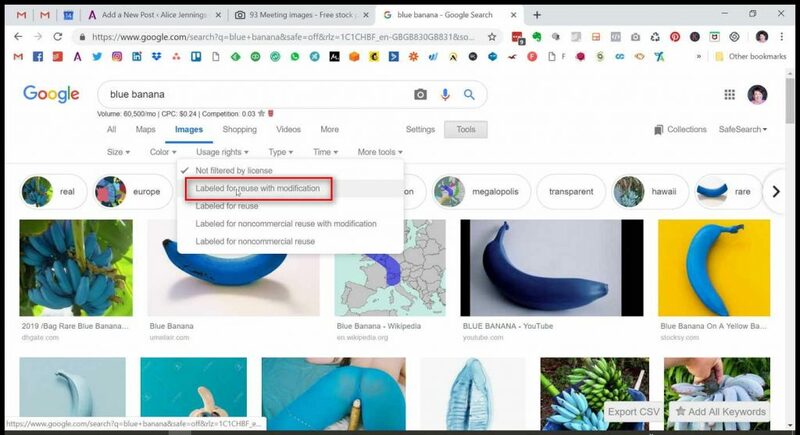 The sophistication of image searches makes it much easier for image owners to find out where their images are being used so ALWAYS make sure you have permission to use the image. This is a terminology issue that is confusing. So to set the record straight, a royalty free image is not necessarily free to use. It just means that you don’t need to pay a royalty every time you use it. The big stock photography website all sell royalty free photos. Creative Commons (CC) is an American non-profit organisation devoted to “expanding the range of creative works available for others to build upon legally and to share”. They have created some easy to understand licences to enable creators (in this case photographers) to easily communicate which rights they reserve and which rights they waive for the benefit of recipients or other creators. Some images licenced under CC may be for personal use but not commercial so make sure if you are using a free image under CC licence that is for commercial use. Firstly you can do an advanced image search using Google to find images that are free for commercial use under the creative commons licence. If you are looking for a specific image this can often be quicker than visiting a number of free image sites as many of the images from the free sites will be returned in the search. 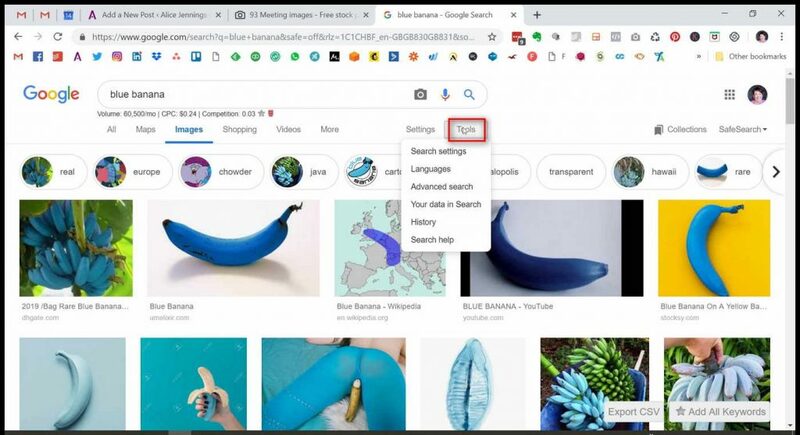 Do a search for your chosen image. I’ve used blue banana. Then select from under the search bar to show the images that match your search term. Next choose tools (see below). This will pop open a new menu. From this menu select the drop down ‘Usage Rights’ and choose images that are Labeled for reuse with modification (or just labelled for reuse if you don’t plan to edit them at all) and you will be shown suitable images. I would still recommend that you check the licence for the image before you use it, it’s not worth the pricey risk not to. Unsplash has VERY beautiful pictures so be prepared to waste at least half an hour just looking through the wonderful images. As it is a collection of photographers submissions rather than a stock photo site it doesn’t have the same range as some other sites and the search doesn’t always yield what you are looking for but for inspirational pictures it’s definitely got the edge. All images are free to use, even for commercial sites but they do ask that you credit the photographer if possible. Due to the site’s increasing popularity there are a number of images that are becoming quite well used so it’s worth having a good rummage around to find things that really suit your brand. You can create an account to save your favourites but it’s not necessary to use the site. Pexels is another great site with lots of highly searchable images. You can use them all for commercial use though the photographers would be grateful for a credit it’s not required. Some images that are particularly useful for startup businesses. Another site of beautiful images… this one has a related free video site which is great if you need some video to liven up your online presence. The sites below are a great resource but all are linked to paid sites. Be careful to scroll down to the section with the free images (they show paid for images intermingled with the free ones to try and lure you in!) I find using these a bit frustrating as invariably the images I like end up being paid for! I hope that’s useful… where is your favourite place to find images? Next time I’ll share my go to places to buy images when the free ones just aren’t quite cutting it. Thanks Alice, some really useful information here. I am constantly amazed at how much is available online for free. I have used Canva for various things such as Facebook and Twitter headings, and even a book cover, and they have a huge library of images that are either free to use or cost $1. And the site itself is free too. How lucky we are.